What to know: A quality production by a celebrity of family music, Tom Chapin and gifted co-writer and producer/performer Phil Galdston. This CD is great for kids ages four to seven because it teaches about getting along with others and expressing your feelings. The lyrics are appropriate and have good messages about feelings. I liked one song called "The Plan" because it explains to kids that you can do whatever you feel like doing such as reading or playing a certain game but when there is more than one of you, you need to make a plan. The lyrics are really geared to the younger audience but the tune is enjoyable for anyone. 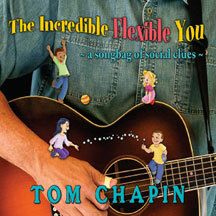 This is a quality produced and performed album by a celebrity of family music, Tom Chapin, and a gifted co-writer and producer/performer Phil Galdston. The energy and foresight in this project is palpable. Co-joined yet artistically separate from a book of the same name, these 12 beautifully produced and performed songs uplift the challenges that young people experience every day in regards to good choices and infusing into socialization with their peers with tools that will help and uplift them with a positive sense of self. Lovely! This album is multi-leveled: engaging music and fun songs on one level and wait, what, on another level - food for thought. The songs that keep on giving. I feel a tightrope successfully crossed that, in other hands, could have come across preachy or pushy are the antithesis of that. Intelligent lyrics. Really! Tom's vocals ride effortless atop Phil Galdston's terrific production and arrangement with a lovely mix of folk meets Beatles that I love. Recording quality is beautiful. This album addresses socialization issues and promotes cognitive thinking more so than any album that's crossed my desk in a while. Reviewed by John Wood. Catch, fun songs from the 3-time GRAMMY-winning pioneer of children's music (created in tandem w/the groundbreaking book of the same title) has special appeal to young listeners navigating the tricky waters of social interaction.